Sometimes it’s better to be lucky than smart. Back in 2002, I purchased a vintage 1937 BMW R5. The bike was tired and in dire need of restoration but it was all there, including a bulging tattered Pendaflex-like folder full of records, receipts, photos, and notes. At the time, I was new to collecting BMW’s and had no idea that the R5 model represented the Holy Grail of the pre-war era. I also had no idea that in the years ahead this special machine would not only introduce me to wonderful people, but it would also take me through a winding road of history. Perhaps most important, my R5’s history intertwines with the legendary BMW racer Jock West. The post that follows is a biography of this legendary man. I have curated primary sources, stories, photographs, and Jock’s obituary to pull together vignettes of his life’s story. Many of the images, letters, and stories herein have never before been published. The unique history of my 1937 BMW R5 has already been chronicled on the pages of Turtle Garage and can be read at this link here. My R5 was registered as HMK 477 and was sold new on January 24th, 1938 from Station Garage in London. HMK 477 was taken to AFN, Isleworth on July 4th, 1938 for a minor adjustment and service. It was at this moment when HMK 477 and Jock West met. 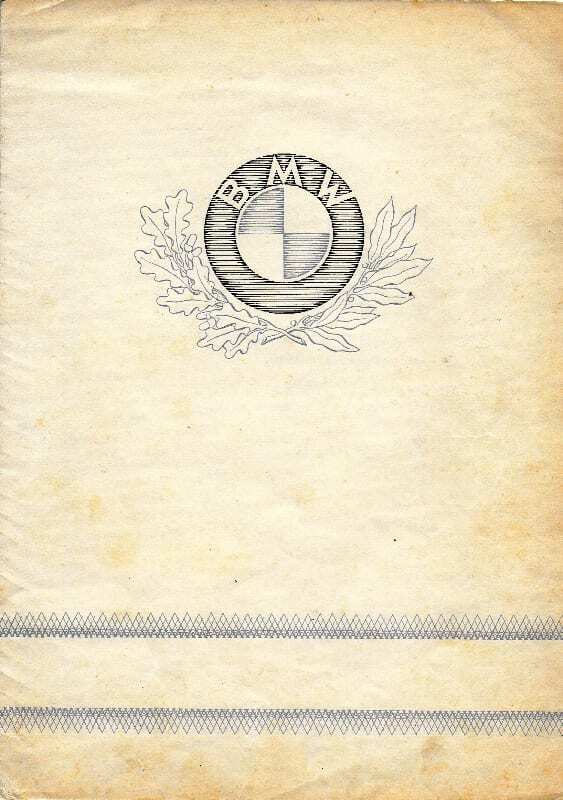 The indicated mileage was 7,373 and the record noted, “Cure clutch drag, fit suitable KLG s/plugs, adjust carbs.” The actual handwritten service log was signed with the initials “J.M.W.” Those are the initials of legendary BMW motorcycle racer Jock West. Sometimes when I look at the R5 sitting in my garage I imagine myself transported back to the late 1930’s when Jock West was twisting wrenches on the very same machine. I dream that I’m sitting in the service garage at AFN in Islesworth. The shop smells of oil and Jock is busy working away on my R5. His careful hands adjust the carbs and he cleans oil off the filler hole. I can only dream and pretend of being there in that moment of time, however, my R5 was there—eighty years ago! 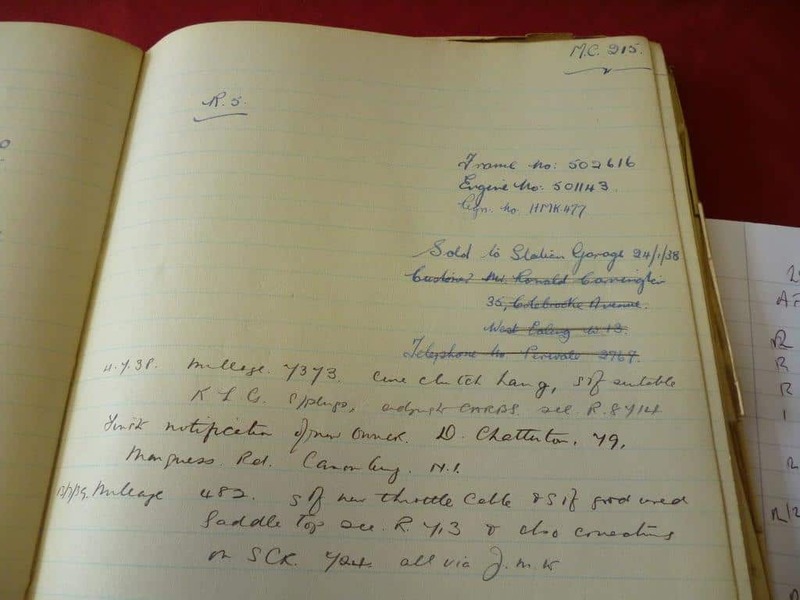 The actual AFN logbook with HMK 477 service records signed by Jock West circa 1938.This document shows the original frame and stem number as well as original owners name and address. Searching the voluminous files of HMK 477 back in 2002, I came across information that led me to Robert Freeman in England. Back in 1968, Robert bought HMK 477 from Errol Bright (HMK 477’s third owner) for ten pounds Sterling. Robert subsequently restored the bike and rode it in the 1970’s and early 1980’s. In 1985, Robert sold his beloved HMK 477 in order to help finance a home purchase. The fifth owner of HMK 477 was Henry Martini who ultimately sold the R5 in 2001 to the dealer where I ultimately purchased the bike. For over a decade now, Robert and I have been friends—corresponding only over email. He has provided me detailed and accurate historical information about HMK 477. He also helped me source other rare BMW motorcycles that were sold through the AFN dealership network in England. Because of Robert, my collection has grown. It now includes three similar machines to HMK 477 (all with the highest provenance and with unique stories). 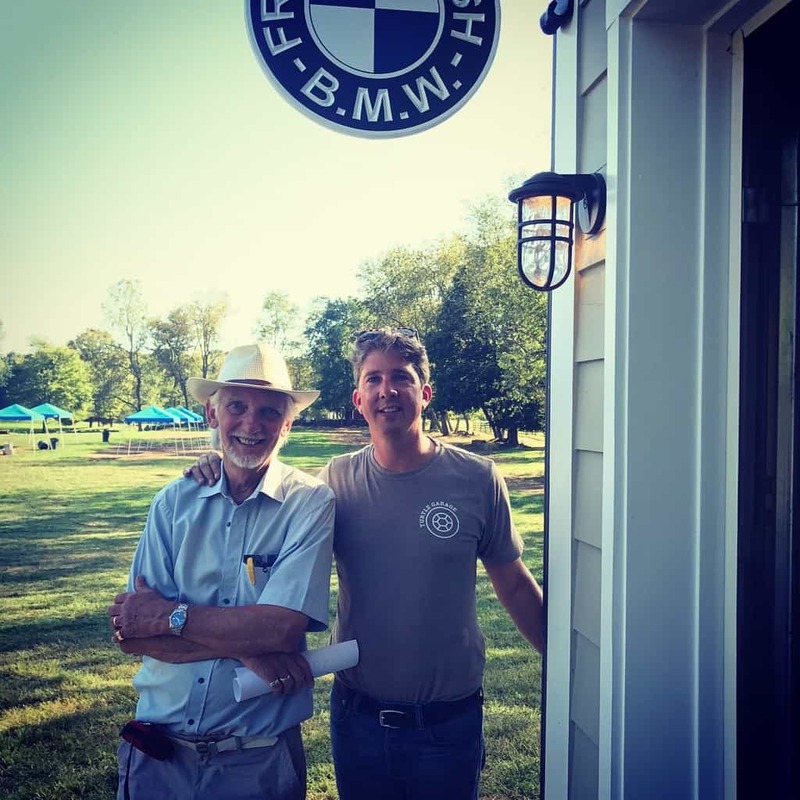 Robert has helped me find a 1936 BMW R5, a 1938 BMW R51, and a 1938 BMW R71—all of which were sold via AFN in England and have both BMW and AFN certifications. Less than three hundred BMW motorcycles made their way to England from 1936-1938 under an agreement between BMW and Fraser Nash (AFN). 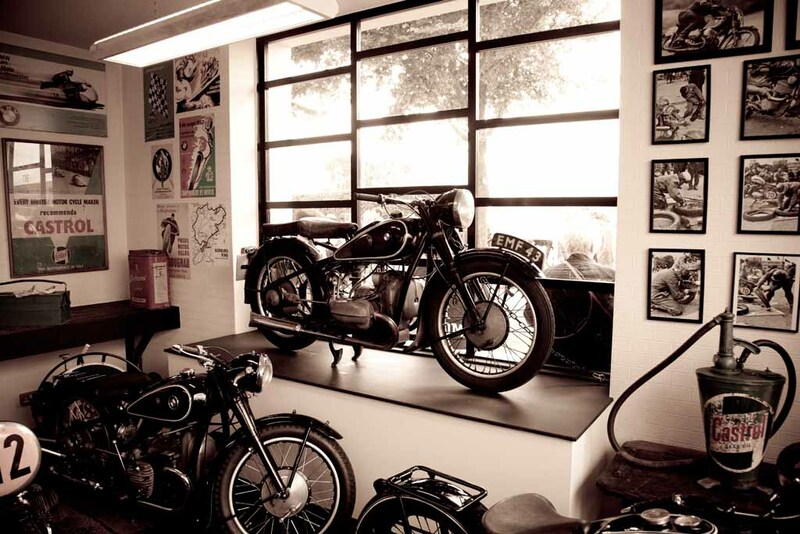 Today Robert is the custodian of the extensive AFN archives and is often called upon by BMW’s own historical archives to authenticate facts on various bikes. Robert has forgotten more than most people will ever know about pre-war BMW motorcycles and I am blessed to know him. Without HMK 477 I never would have met Robert and my appreciation for Jock West would not exist. It is more than likely without Robert all of this history would be lost. I finally met Robert in person this September when he came to America to attend the Turtle Invitational. It was an emotional reunion because we had never met each other in person. Upon his arrival to New York, we had a fabulous lunch at Jean Gorges Inn at Pound Ridge where Robert presented me with a gift (a family heirloom really) which was a pre-war BMW roundel pin. The pin had a beautiful worn patina and the lettering and spacing were distinctly different than the modern BMW roundel. The historical significance of the pin is that back in 1937 it was given to Robert’s father Cyril Freeman by Jock West himself! 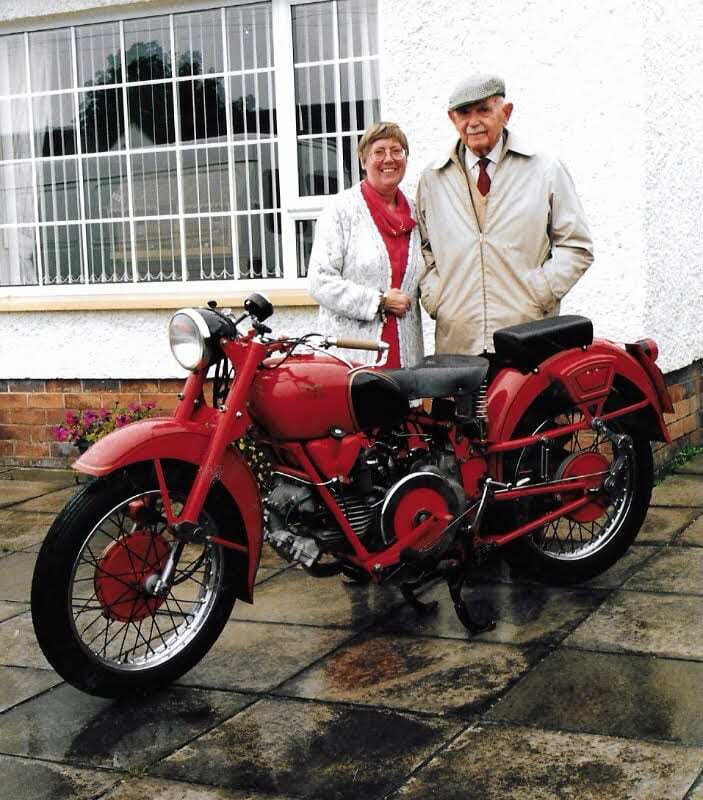 Robert’s father purchased a brand-new BMW R5 (registration number FJO 465) in 1937 from AFN. When Cyril brought his R5 in for a routine service, Jock handed him two pins. Today Robert has one and I am the custodian of the other. The Turte Garage now enjoys yet another tie to Jock West. The Robert Freeman/Jock West BMW pin. Philip Richter and Robert Freeman at the Turtle Invitational September 2017. Notice the Frazer Nash BMW sign above us! From original 1936 stationary Robert provided I had the sign replicated by Briarwood Signs. It now proudly hangs outside my garage. West was born in Belvedere, Kent to an English father and a Scottish mother. He initially concentrated on grass track racing on an Ariel motorcycle and was successful enough that the Ariel factory would sponsor him at the 1931 Manx Grand Prix. West progressed to compete in the 1933 Isle of Man TT where he impressed Triumph manager Edward Turner, who hired him as a rider. Afterwards, he took a job as sales manager for BMW. 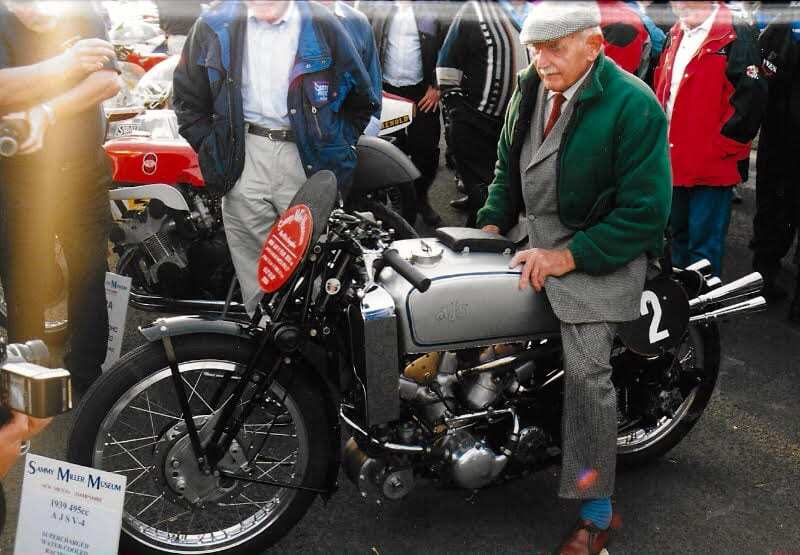 West rode a BMW to victory at the 1937 500cc Ulster Grand Prix held on the Clady Circuit. His win marked the first time that a non-British motorcycle had won the 500cc class at the Ulster Grand Prix. West returned the following year to win again at the 1938 Ulster Grand Prix. At the 1939 Isle of Man TT, he finished second behind his German BMW teammate Georg Meier in the Senior TT. During the Second World War, West served in the Royal Air Force, rising to the rank of Wing Commander. He managed factories where crashed and damaged aircraft were rebuilt for combat and, was awarded the Order of the British Empire. After the war, he joined Associated Motor Cycles as a sales director. 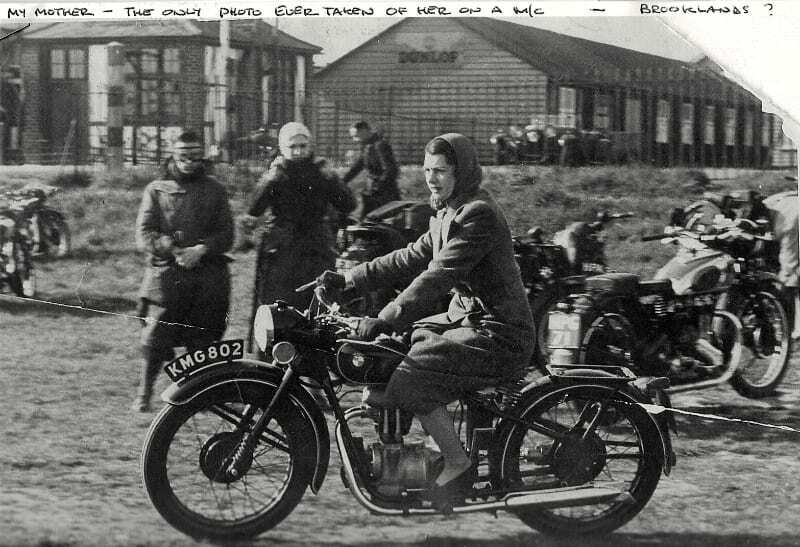 AJS had developed a new race bike known as the AJS Porcupine and West was the first person to ride the machine. He entered the 1947 Isle of Man TT with the bike but, teething problems relegated him to a 15th place although, he recorded the third fastest lap time. Leslie Graham would later ride the AJS Porcupine to win the inaugural 1949 FIM 500cc world championship. 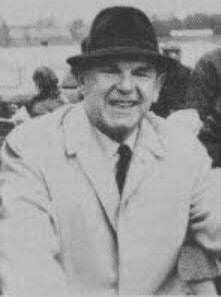 After a fifth-place finish in the 1950 Ulster Grand Prix, West retired from racing at the age of 41. He continued to work for Associated Motor Cycles until 1961 and later rejoined BMW. We knew Henry Martini for many years and attended his funeral. I had known of Mr. West for most of my life but only got to know him at the opening of Stanley Woods Exhibition at the Ulster Folk & Transport Museum N. Ireland in 1986. This led us to many visits to his home near Dover en route to Italy by road. 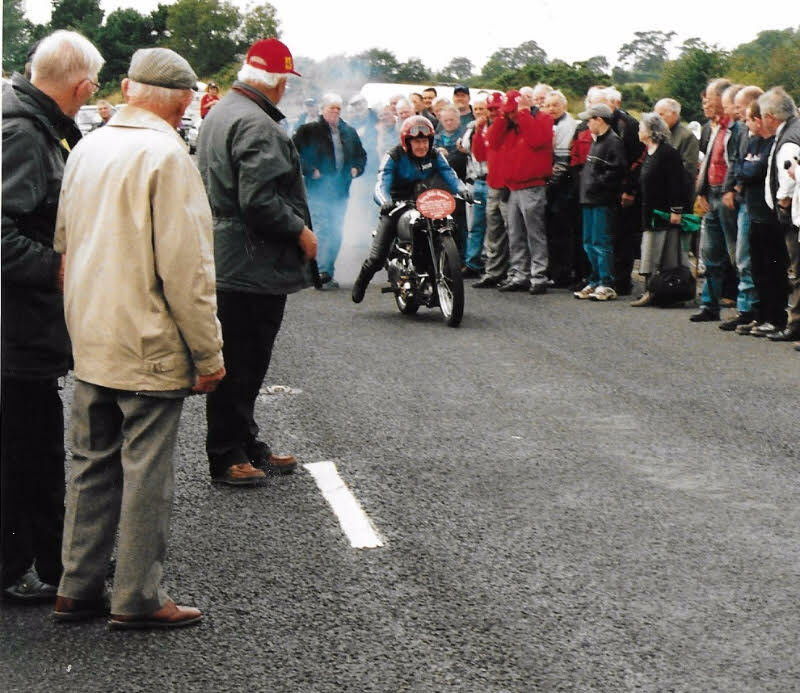 2002 marked 50 years since racing took place on the old Clady Circuit of the Ulster Grand Prix, they closed off the public roads for a one-off demonstration event that August and we invited Jock to come and stay with us at our home. Jock had won the 500 events of UGP in 1937 & 1938. BMW made it clear they did not want to come in August 1939—only weeks away from the start of WW2. Joan and Jock with David’s Guzzi Falcone. David asked the 92-year-old if he would have liked to have been riding that day. He said he would not have minded riding as it all came back to him quickly. 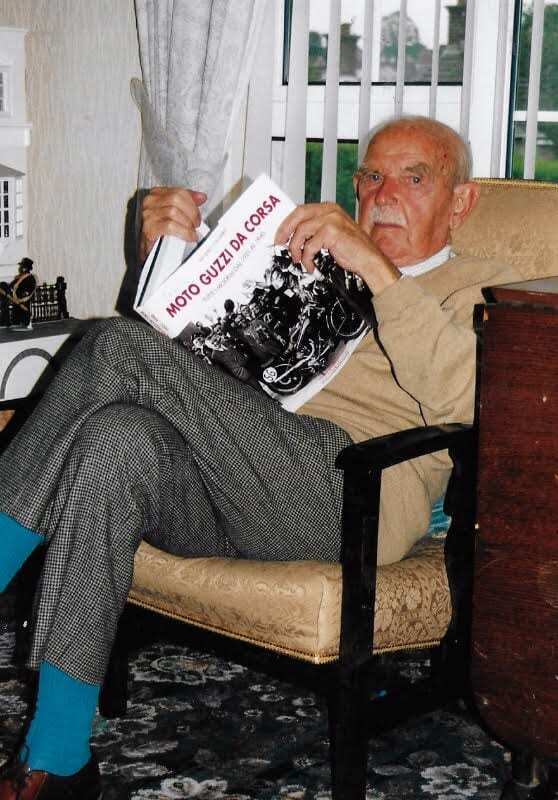 Jock reading a book on pre-1940 racing Moto Guzzis. 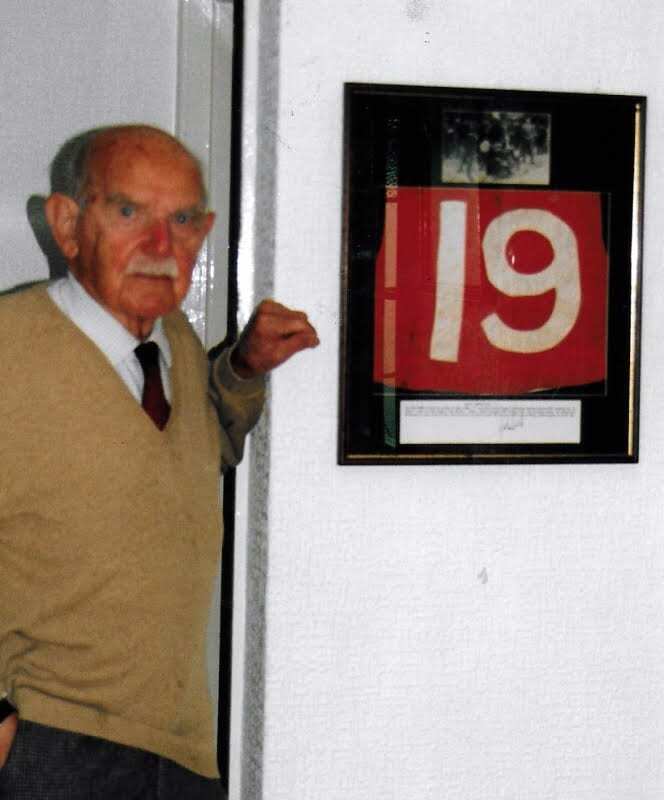 Jock with his red back number which he gave to David. It was used in the 1937 Senior TT. From 2002 in the “Clady” event. Jock is wearing Joan’s coat as he was cold. 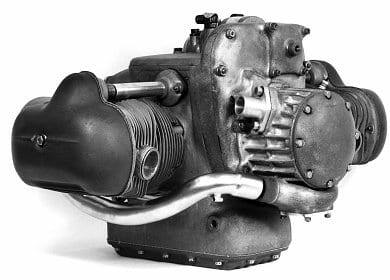 He took this very machine to Chimay Belgium to the Grand Prix des Frontiers in July 1946 – before the ban on Superchargers came into effect – and gave the machine it’s only victory – It’s pre-war rider Walter Rusk was also in the RAF and was killed in 1940. Jock is standing by the side of the road as Sammy Miller demonstrates this one-off machine. This photo was taken in 1969. 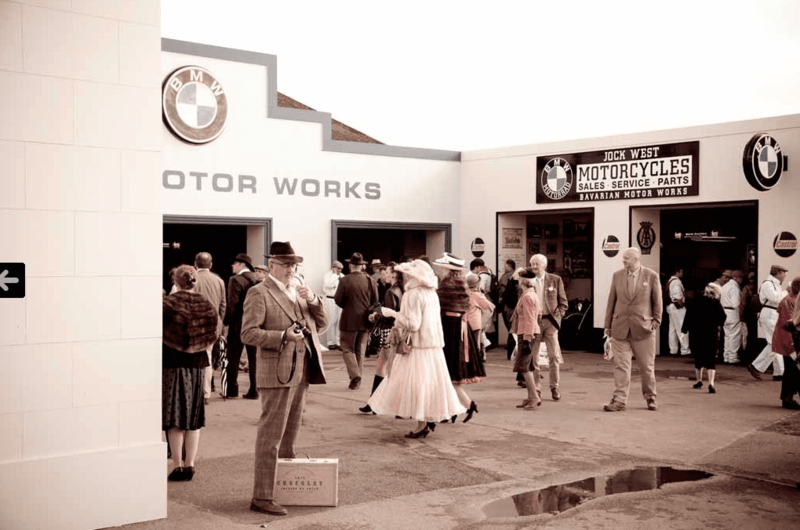 Reposted from BMW Motorcycle Magazine September 2013: The Goodwood Revival. A replica of Jock West’s AFN shop at the Goodwood Revival in 2013. An interior view of the replica of Jock’ shop. Fans of wholesome German food were catered for in the BMW Revival-fest where they could sample a variety of grilled and smoked sausages, sauerkraut and Bavarian beer while planning their next port of call. There was no need to go too far though, because just around the corner, other parts of the BMW Group were putting on their own shows, with some incredible attention to detail. Jock West, who died on June 6 aged 95, was the last surviving rider to have won a major motorcycle Grand Prix during the 1930s, and the only non-German speaker to have won a Grand Prix on a 500 cc BMW. John Milns West – always known as Jock and as a boy dressed in a kilt by his fiercely Scottish mother – was born at Belvedere, Kent, on February 28, 1909, the son of a market gardener who grew peaches. He was introduced to motorcycling by a neighbor’s son who had a 211 cc two-stroke Levis. When he was 14 Jock bought the Levis and progressed through a series of second-hand machines to a 350 cc Zenith, which he entered for his first race at the Crystal Palace track in south London in 1927. 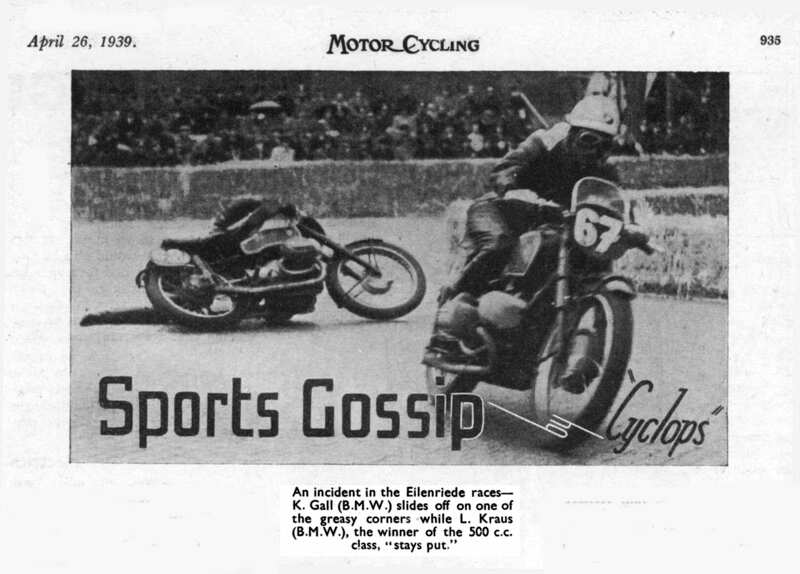 The debut was not a great success: “I crashed, fell on my head and woke up in the paddock not knowing where I was.” West concentrated on grass-track racing on the fast and bumpy circuits in south-east England, including the then unsurfaced Brands Hatch, making his name on Ariels prepared by Walter Hartley, who was Plumstead’s agent for the make. His grass-track successes on Ariels prompted the Birmingham factory to sponsor him with a new machine in the 1931 Manx Grand Prix, the race around the Isle of Man TT circuit for amateur riders. The crankshaft broke on the first lap, but West returned the following year riding an Ariel built up from bits and pieces found in Hartley’s workshop. He crashed in practice but did well in the race until the engine failed on the last lap. He finished 20th. 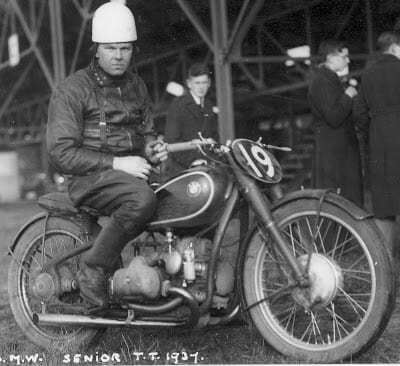 In 1933 West moved up to the TT, riding a three-year-old overhead camshaft 350 cc AJS; a broken inlet valve did for his chances, but he impressed the Triumph boss, Edward Turner, who hired him for the event the next year. Teamed with the experienced TT riders Ernie Thomas and Tommy Spann, West was determined to do well, but the race proved something of an epic. “I arrived at Ballacraine [a sharp right-hand bend seven miles from the start] on a wet road but without my bike,” he recalled. “I picked it up, restarted and jumped on, only to find that the right footrest had broken off in the crash. With my leathers torn and my right foot trailing, I set off, only to be black-flagged at Ramsey.” After officials had checked the bike, he was allowed to continue but was stopped three more times and eventually forced out of the race by a nail in his front tire.He finished 15th in the 350cc class of the TT in 1935 and rushed home to finish 8th in 1936. Meanwhile, he completed a five-year apprenticeship in heavy engineering with GEC, before becoming sales manager of the new BMW import business. West commuted from his home in Kent to Isleworth on a 750 cc BMW, picking up numerous speeding tickets. He finished 15th in the 350cc class of the TT in 1935 and rushed home to finish 8th in 1936. Meanwhile, he completed a five-year apprenticeship in heavy engineering with GEC, before becoming sales manager of the new BMW import business. West commuted from his home in Kent to Isleworth on a 750 cc BMW, picking up numerous speeding tickets.BMW had recently introduced a new Grand Prix machine with a supercharged flat-twin overhead camshaft 500 cc engine and an advanced frame with a hydraulically-damped telescopic front fork. Its first major success came when Otto Ley won the 500 cc class at the Swedish Grand Prix in 1936. The next year BMW sent a factory bike with a mechanic over for West to ride in the TT. He had earlier passed an initiation test in Germany, where he rode a similar machine during the practicing for a German national event at Hanover under the critical eye of the BMW team manager, Sepp Hopf. 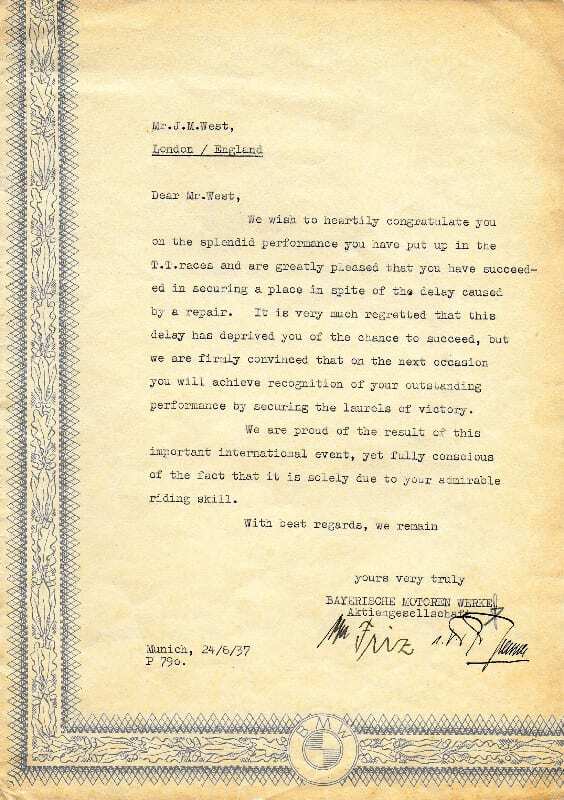 BMW insisted that West finish the race rather than go for glory. So he took things easily, only to run out of fuel on the last lap. He pushed in and finished sixth. 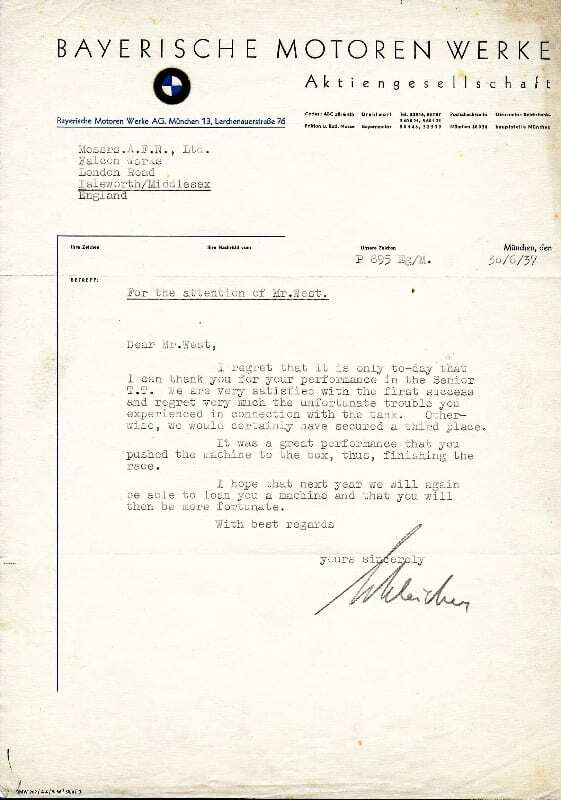 Pleased by the result, the Munich factory agreed to back West in the ultra-fast Ulster Grand Prix, then run on the Clady circuit, which included a bumpy seven-mile straight.“The roads on the old Clady circuit were narrow and heavily cambered which made things tricky in the pouring rain,” West recalled. “I worked my way through and at the end was in the right place.” He completed the 12-lap, 246-mile race in two hours, 41 minutes and four seconds, at an average speed of 91.46 mph, with the fastest lap at 93.65 mph. It was the first time a non-British machine had won the big class at the Ulster. In 1938 BMW fielded a team of three in the Isle of Man – the rising star Georg Meier supported by West and the Austrian Karl Gall. But Gall was eliminated by a crash while practicing and Meier retired on the first lap with plug trouble. West had a steady ride to fifth place and with Gall injured he went to the Belgian Grand Prix to support Meier. There he finished third, beaten only by Meier and the Norton star Freddie Frith.Later in 1938, West recorded his most important win for BMW. 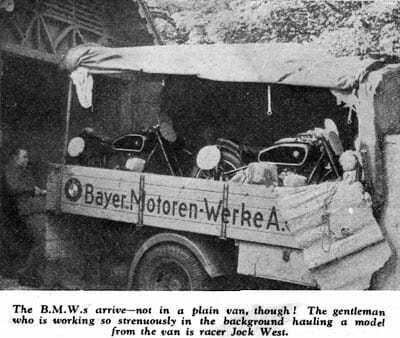 While Meier concentrated on the German Grand Prix, BMW sent a bike and mechanic to the Ulster for West to ride, six days after the German event. Again the race started in wet weather but when it stopped raining, West went for it. There was a great celebration when he lapped at a record 98.93 mph, which also beat the records at the rival circuits in Belgium and Sweden. He eventually won the race at an average of 93.98 mph. 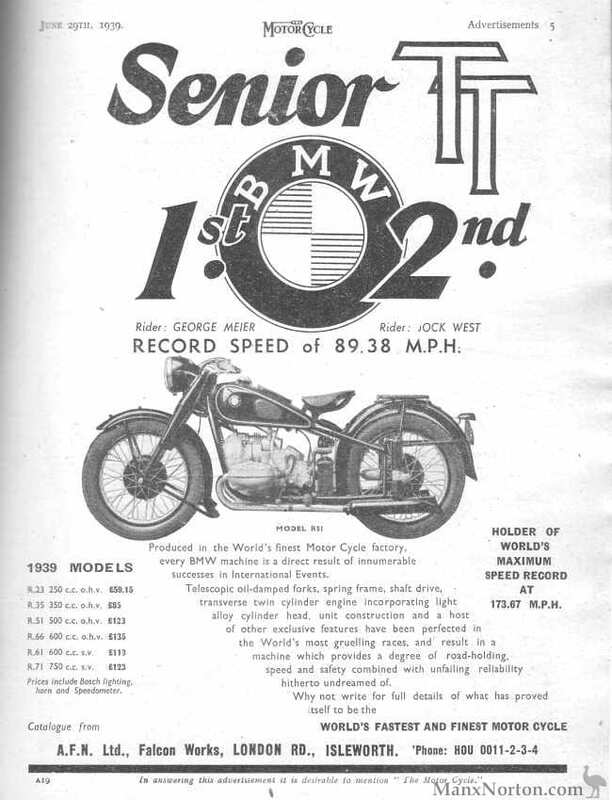 Later in 1938, West recorded his most important win for BMW. While Meier concentrated on the German Grand Prix, BMW sent a bike and mechanic to the Ulster for West to ride, six days after the German event. Again the race started in wet weather but when it stopped raining, West went for it. There was a great celebration when he lapped at a record 98.93 mph, which also beat the records at the rival circuits in Belgium and Sweden. He eventually won the race at an average of 93.98 mph. 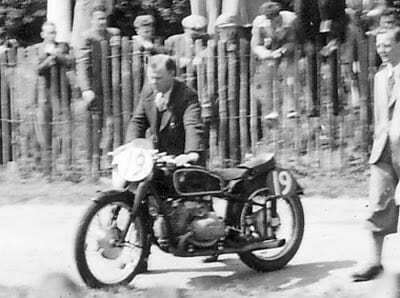 In 1939 West again supported Meier at the TT, where the German won the 500 cc Senior TT with West in second place. But his hopes of winning the Ulster for the third time were dashed when BMW failed to supply a machine. Again the Ulster followed the German Grand Prix, and in an effort to persuade BMW to let him have a bike for the Irish event Jock answered an SOS from BMW to ride in Germany, after both Meier and his new team-mate Ludwig Krause had been injured during the Swedish Grand Prix. West was right on the tail of Dorino Sorafini on the supercharged four-cylinder Gilera when a terrible vibration in his accident-damaged bike forced him to pull up. By then it was mid-August, and West rushed back to Munich where the BMW factory pulled strings to get West and his wife on one of the last flights out of Germany to England. Throughout his career with BMW, the factory never paid him.During the war West served in the RAF, rising to Wing Commander. He specialized in running factories where crashed and damaged aircraft were rebuilt for combat; he was awarded the OBE. After demob, he joined Associated Motor Cycles as group sales director. 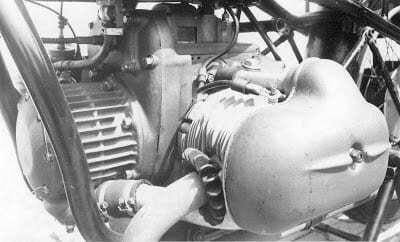 AMC was then developing a new twin-cylinder 500 cc racer, known as the “Porcupine” because of the spiky cylinder-head finning, which West was the first to ride. It had been entered for the 1947 TT but was only just ready in time – the first test was when West rode it down the A2 Rochester road on Whit Monday. In the race itself West suffered all sorts of teething troubles, yet again pushing home to finish 15th – albeit with the consolation of the third fastest lap at 84mph. He finished third in the Ulster. At the Ulster, Jock disputed the lead until he was slowed by ignition problems. With his 40th birthday looming, he quit racing at the end of that season. 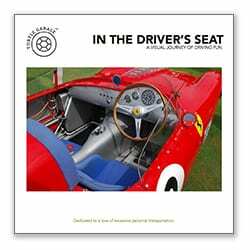 At the Montlhery circuit near Paris, he had one last fling on the Porcupine, when he, Les Graham and the French ace Georges Monneret took six 500 cc world records, ranging from the two-hour at 108.49 mph to the five-hour at 107.12 mph. West continued with AMC until 1961, when he became sales manager for Peter Agg, who was importing the Italian Lambretta scooter. After two years he rejoined BMW. His wife died in 1997, just weeks short of their 60th wedding anniversary. West continued an active life, which included two rounds of golf a week. He is survived by his son. The advanced BMW supercharged 500 cc motor. 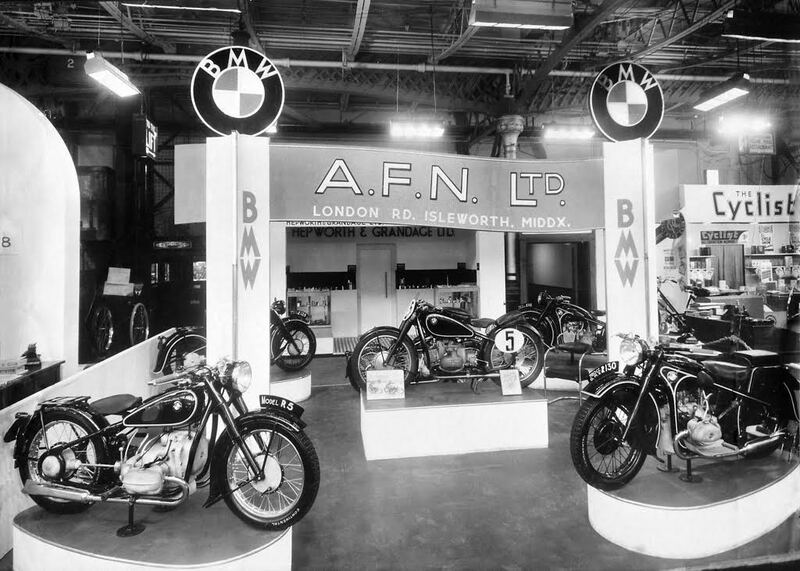 A photo from a 1937 AFN show display with a supercharged 500 front and center. Bob Lutz Bombshell: Cars Are Over! Great to read the news about the R5, also the story of Jock West. The R5 is in LA getting a 100-point makeover to be one of the best on the planet. It deserves this status! Hope to see you soon. The day in the Beck goes down in the Turtle History books as the finest ever! Philip, thank you for another great Sunday morning read. The detailed research and photos bring Jock Wests story to life. The only thing missing as I drink my morning coffee, is an R5 sitting in the Living room! I look forward to your next installment.